Want to experience some of the most haunted places in Maryland? Head to Baltimore! 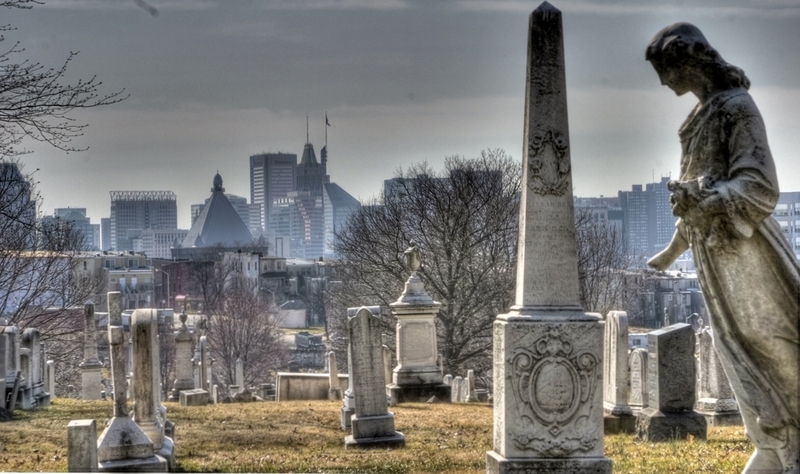 Baltimore is no stranger to ghosts. Here are five of the spookiest, most haunted places in the city! Fort McHenry is known for various wars. 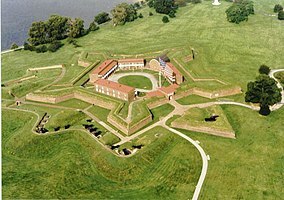 However, though only a few Americans died there during the War of 1812, and only 15 people died there during the Civil War, Fort McHenry was later the place where nearly 100 nurses and patients lost their lives to a flu epidemic in 1919, when the structure housed a hospital and surgical center for World War I. Known for its hauntings, the fort was featured in an episode of Haunted History on the History Channel. The episode revolved around the ghost of an African-American soldier who patrols along the outer edge of the fort. He seemingly wears a military uniform and is holding a rifle, according to people who have seen the ghost. Some even thought he was a historical re-enactor. Park rangers have reported hearing footsteps and having lights turned on after they've turned them off. In service from 1854 through World War II, the U.S.S. 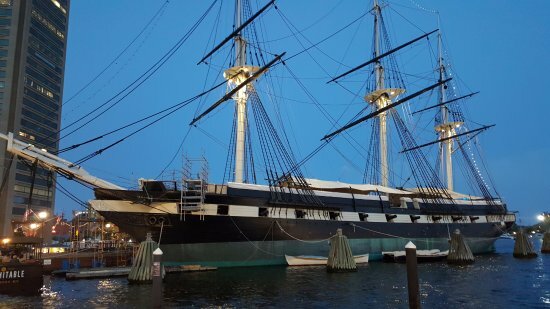 Constellation is currently located in Baltimore's Harbor. It was also used as a training ship for the U.S. Navy before becoming arriving at the harbor. Several people have reported seeing strange figures while on this ship. One instance describes a sighting of a priest leading a ship tour -- but it was discovered later that no man of his description worked there as a guide. The graveyard was first established in 1786, and the church was completed in 1852, more than 60 years later. 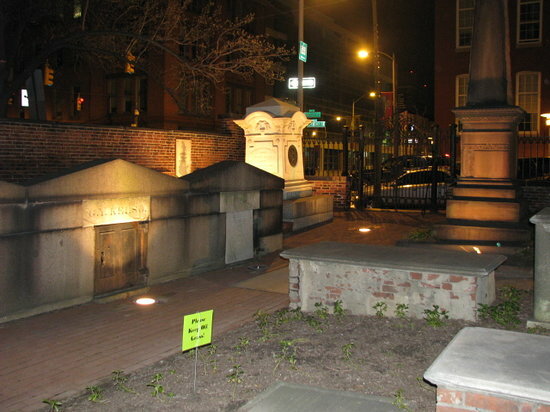 Many influential people have been buried here, including Gen. Samuel Smith and Col. James McHenry, both prominent figures in the War of 1812. However, the cemetery is most famous for being the final resting place of Edgar Allan Poe, who is the focus of many local ghost stories. Considered one of the top haunted hotels in America, the Admiral Fell Inn is an epicenter for ghost stories. Parts of the building date back to the 1770s when it was a theater and boarding house in a neighborhood filled with brothels and saloons. Guests have reported seeing floating sailors and disappearing butlers knocking on their doors. A hotel manager is also said to have heard a loud party after the hotel was evacuated during a hurricane. While these days The Middleton Tavern is a lively restaurant, it was established all the way back in 1750 when it was sold to ferry operator Horatio Middleton, who needed to provide lodging for his clients. 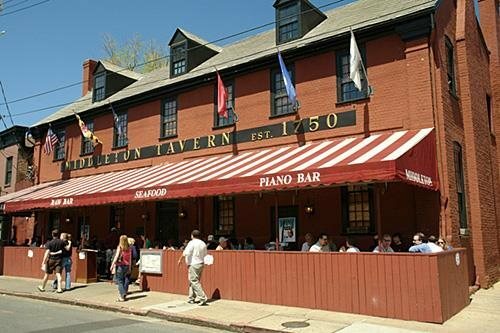 It is technically located in Annapolis, but is so haunted that it shows up on multiple Baltimore haunted hot spot lists. Visited by prominent influences such as George Washington and Thomas Jefferson, it was also a frequent meeting place for the Free Masons and the Maryland Jockey Club. Various ghost encounters have occurred, and the ghosts apparently cause glasses and plates to fly off the shelves. Specifically, one ghost (named Roland by the restaurant staff) shows up and stares at the harbor from time to time. Do you know any other haunted areas in and around Baltimore? Let us know in the comments below! Head to Annapolis to check out these 5 haunted spots!